The only one left was Oxford, which had gotten away when I was too slow on trip to collect Belford and Oxford with Brian. When Susan and I had a free weekend in early September, project Oxford was a go. Rather than repeat the camping exercise, we just got up super early and left Boulder @ 2:45pm to drive back to the Missouri Gulch trailhead outside of Vicksburg (the non-existent town up county road 390). Everything started well. We got started at 6am and made a steady but moderate pace up the treed switch-backs. When we stepped out of the trees around 11,500′, a powerful wind turned the experience into a cold Spring climb. And we were wearing Summer clothes (position #1 on map). The trail had been worked on since my last visit; it was a great trail. But since it was covered with snow and ice, it made for adventurous hiking: slipping and sliding everywhere. 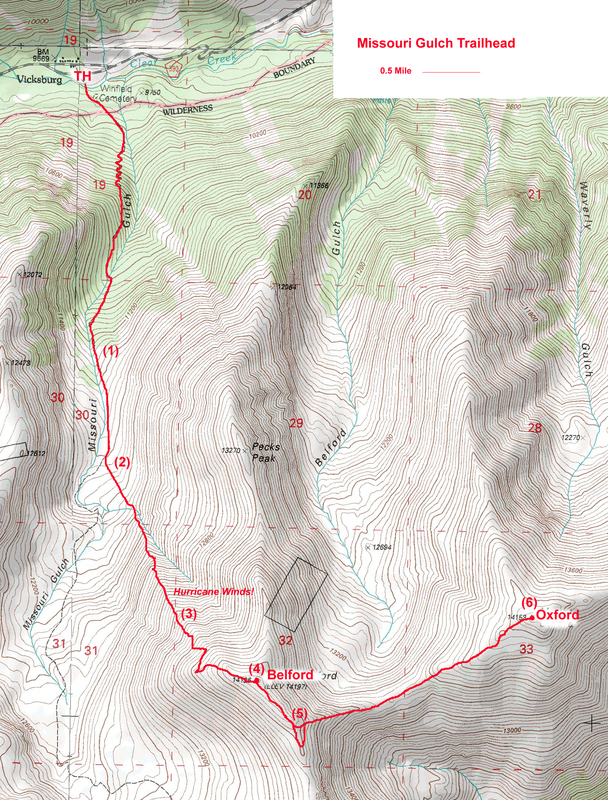 We persevered to reach the start of the NW corner of Mt Belford (position #2), and then we started up. We were freezing, but could continue as long as we kept burning calories. The wind was brutally cold and strong enough to push us around. Susan was worried about the possibility of being blown off the mountain. I was able to demonstrate that was not possible by jumping into the air during a strong gust; it could only move me a few inches. Still, we had to stay low and balanced to avoid being blown down (position #3). We hit the summit at 9am (position #4) and were met by the strongest winds so far (I estimated it was up to 60 mph). We sought some shelter on the backside of the summit where we found a couple fellows planning to head back down to Missouri Gulch trailhead. Susan said she needed to get out of the wind and would descend with our new friends. We said our farewells and I headed SE from Belford. As I looked down the ridge at the peak a few miles distant, I suddenly regretted not bringing a map. I thought Oxford was so close as to be obvious, but I could only see a peak that looked several miles away. Resigned to a long trek, I started toward the peak (it was Harvard). After a short distance (position #5), I decided that something was wrong. I could see that I would have to descend too far to reach the peak I was aimed at. I stopped to look around and found a big peak behind my left shoulder. It didn’t look high enough to be a 14er, but it was the only thing that made sense. I did a u-turn and worked across the saddle to the bland looking peak that I hoped was Oxford. I stayed on the Oxford summit (position #6) for a minute to snap a photo and then headed back to Belford, where I arrived at 12:20pm. The trek back from Belford was made very easy by the brand new trail; I tried to go fast to catch up to Susan. But, they were already at the trailhead when I left Belford’s summit; they had not lingered in the wind. I found Susan waiting at the truck when I arrived at 2:20pm. It was a good day; my effort included 5800′ of elevation in 11 miles of hiking over 8.5 hours to bag my 28th 14er. Susan’s day was a bit shorter, but she’s a beginner who hung when cold and afraid of the conditions; she’s a trooper with six 14ers to her credit. This entry was posted on April 17, 2010 at 12:35 pm and is filed under 14ers, mountaineering, Trip Reports. You can follow any responses to this entry through the RSS 2.0 feed. You can leave a response, or trackback from your own site.